Rocksteady's Batman: Arkham City is 100 days away. Released on October 18th the game already looks pretty amazing. Today Rocksteady have released a new trailer which gives us a taste of the evil genius known as 'The Riddler'. Even more interesting the Game Studios have embedded a Riddle inside the trailer with the challenge to be solved by Friday. Hit the jump to check it out. 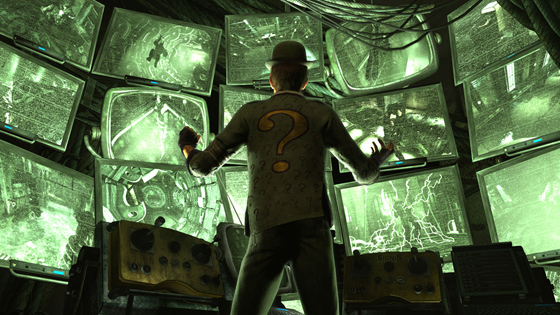 Some members over at the Arkham City Community forums have already solved one of the easier clues in the in the trailer. The trailer contains the following words with numbers in the middle. ridd(9)le m(1)e t(13)his Wh(2)at doe(5)s (20)it t(20)ake t(5)okee(18)p a(20) Shar(8)p Pup(1)pet o(14)n (25)a Str(15)ange str(21)ing? Ergo, The Riddler is telling Batman, "I am better than you." Well thats an easy one as community manager Sarah May states a much more complex riddle is waiting to be solved in the trailer which you can try to solve below at the bottom of the page. "Good work guys, however there is one other more complex clue/riddle in there that will really test to see if you are smarter than a bat.Work it out by FRIDAY and I will release a never seen before Riddler asset." 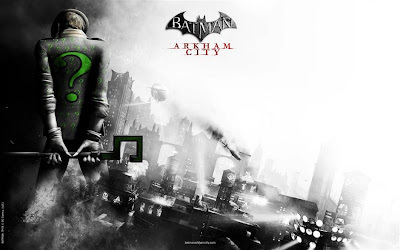 I'm reading: GAME NEWS: The RIDDLER Debuts in the New Trailer for Rocksteady's 'BATMAN: ARKHAM CITY'Tweet this!